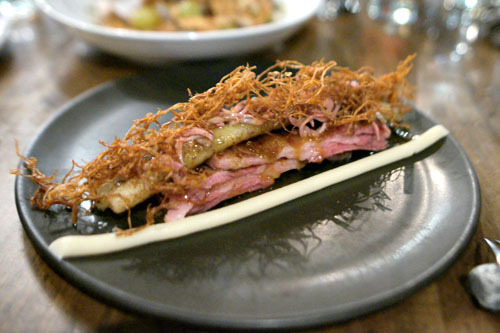 It'd been a while since I last visited Ink, and I was curious to see what the restaurant was up to these days. For better or worse, I felt compelled to do it proper like I did my first time here and order the entire menu, a much more challenging proposition now due to the presence more items as well as larger portion sizes. The bar (now run by Gabriella "Gabby" Mlynarczyk) ended up sending out every single cocktail on the menu, kicking things off with these two. The gin cocktail was pretty neat, with a salty, citrus-y blast on the attack that really tempered the booze, all while the drink decreased in intensity leading toward a short, clean finish. 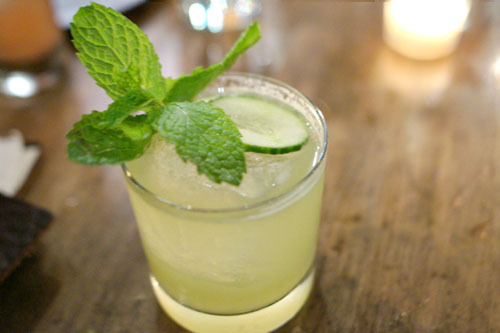 The mezcal, meanwhile, was rather nice as well, with the smokiness of the spirit well balanced by the contrasting sweet, sour, and cucumber-y notes present. 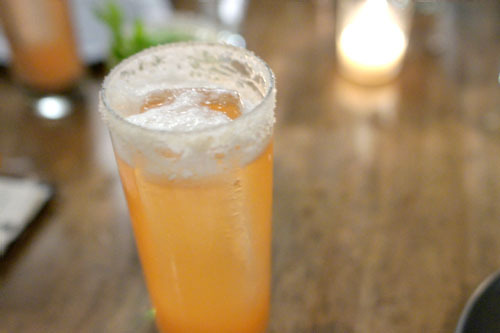 Very subtle for a mezcal drink. 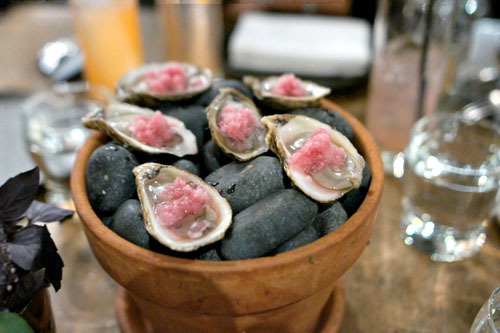 Oysters were really, really nice, with the sour-sweetness of the mignonette playing perfectly off of their inherent brine, making for an utterly balanced and nuanced presentation of the bivalves, replete with some textural contrast to boot. 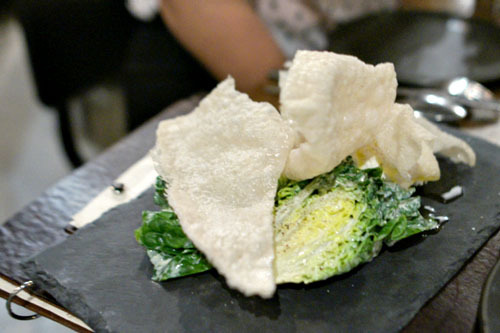 Here was what could be viewed as a thoroughly reworked Caesar salad. The lush, cool, creamy nature of the burrata made sense against the lettuce, while the lemon-y dressing added a bit of tartness to the fray. 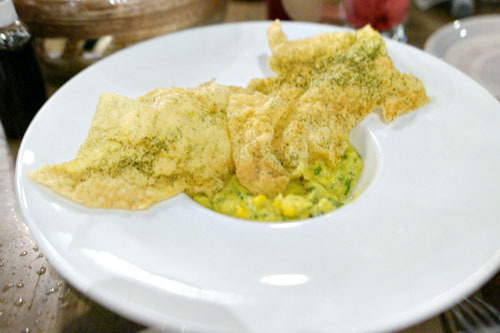 However, the key was the use of those anchovy crackers, which contributed an integrating salinity that really brought the dish together (while adding a lovely crunchiness in the process). 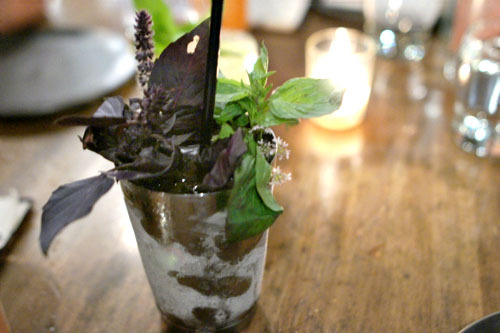 Next, we had a veritable herb garden in the form of a blended scotch cocktail, its refreshing, fragrant aromatics leading to a silky smooth booziness from the whiskey cut by the sweet spice of Cardamaro--very cool. The manzanilla was also appealing, with a sweet, soft, floral, fruity nature to it that went beautifully against the sherry--almost apple juice-y in nature. Asparagus arrived cooked in hay, giving it a cool smoky, almost meaty character that just worked with the lushness of the goat's milk. Also crucial: the dates, which imparted barely enough sweetness to keep things interesting. 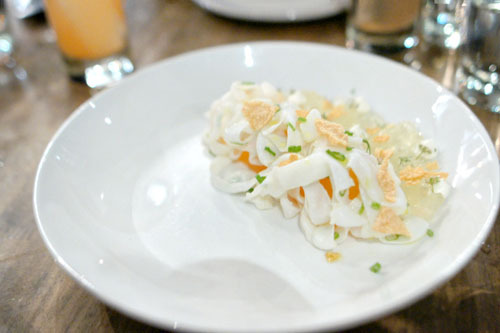 The Chef is somewhat known for his cuttlefish noodles, and it's easy to see why. 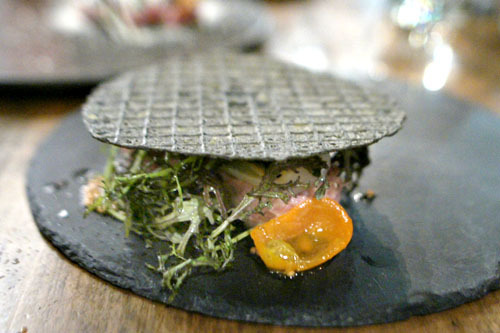 Texturally, they were pretty amazing, with a soft, silken consistency to them, and worked wonders as a base to the dish. The slight spice of the gelatin paired gorgeously with the sugary, succulent fruit as well, while vesicles of finger lime added pin pricks of tartness into the mix. Even better? The fantastic savory bits tossed in--overall, a symphony of subtleties. 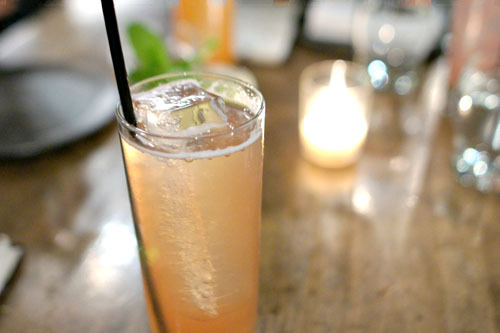 The islay scotch is ostensibly Voltaggio's favorite drink, and I can see why. It's a riff on Sam Ross' Penicillin, but is made completely with Laphroaig, leading to a stronger, smokier character than usual, but one that's still eminently balanced by the sweet 'n' sour notes present. 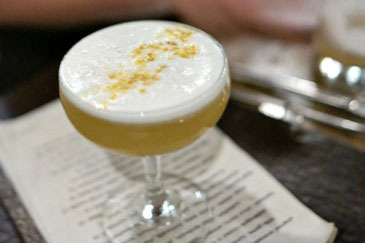 Sticking with the whiskey theme, the bourbon cocktail also worked, with a strong bittersweet bouquet leading to a viscous body imbued with counterbalancing fruity and tart notes, all set against an apparent background of bourbon. There was a bit too much going on for me here. The fish of course was on point, and the contrasting thrusts of salty, sweet, creamy, tart actually worked with each other, but the combination of that and the hamachi tended to over shadow the latter. This was another tricky, yet effective dish, with the sweetness and brine of the crab beautifully matched with the contrasting forces of astringent char and creamy lushness in the avocado. I really appreciated the light, almost ethereal quality of the sponge, too, which served as a moderating element in the course. 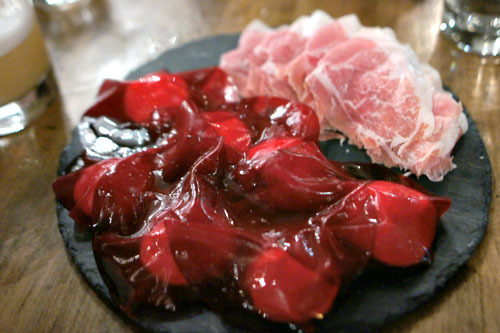 Next was quite possibly the coolest presentation of sliced ham I'd ever encountered. 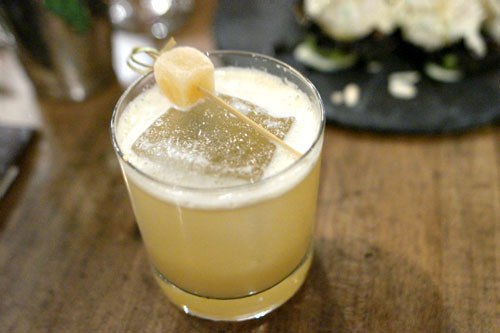 Taken in isolation, the La Quercia was exactly what it should be: slick, fatty, nutty, and oh-so tasty. However, combining it with the creaminess of yogurt and sweetness of beets resulted in some pretty amazing flavor profiles that just made perfect sense. 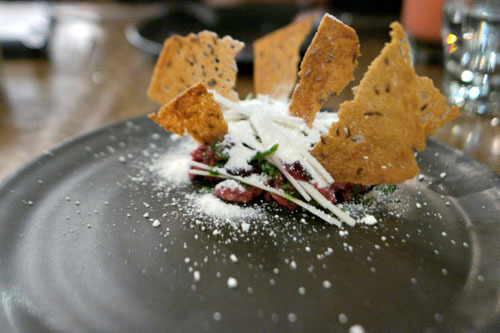 The beef tartar was a bit of an improvement over the previous version of the dish I'd tried. Texturally, the meat was flawless, and I liked the countervailing levity and intensity brought on by the hearts of palm and sea bean combo. However, the crux was that horseradish, which really did a fantastic job in providing a blast of heat that just tied everything together in stellar fashion. Lovely crunch and counter from those rye chips, too. 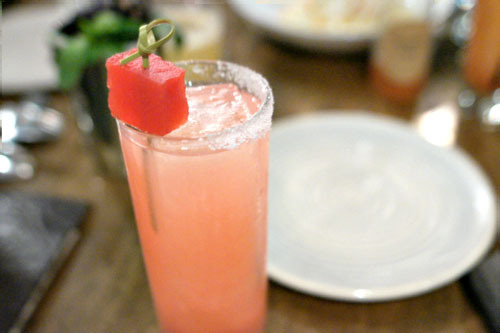 I rather fancied the tequila cocktail, with its wonderful sweet spice from the orgeat-mole combo that really formed a unified front with the spirit. And the vodka? I swear it tasted of Sour Patch Kids, not necessarily a bad thing mind you. 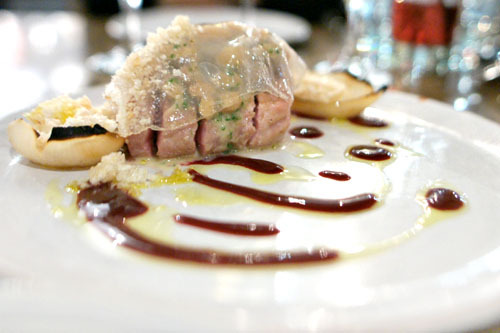 Duck rillettes came in an untraditional presentation, but the flavor was there in spades. The depth of the duck took center stage, faultlessly paired with the smoky savor of those leeks, all while the kumquats gave up a hint of tartness. I liked the "hat" here too, which was key in providing a modicum of texture to the course, along with additional complexity of flavor. Here was a fun, novel preparation of corn. Its sweetness was keenly displayed, yet at the same time, expertly tempered by the green onion. It would've been tasty enough as-is, but the incorporation of "Doritos" is what made the dish, with the chips adding a wonderful crunch and savor to things. 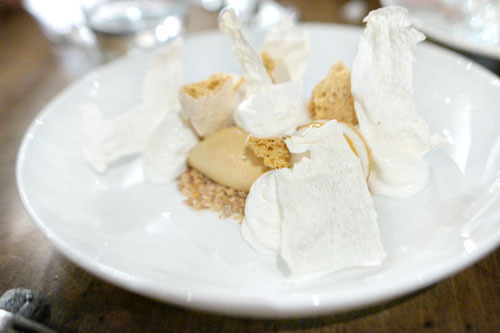 You could almost call this a throwback to the papas arrugadas from Voltaggio's days at The Bazaar. 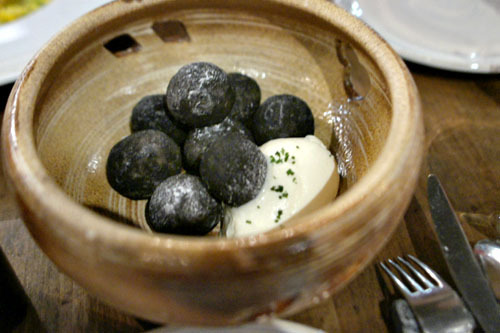 Potatoes arrived pitch black and wonderfully salty, a great complement to the dab of sour cream in the bowl. However, what made this really special was the included spray bottle of black vinegar, which imparted a crucial piquancy to the taters that really made the dish work. 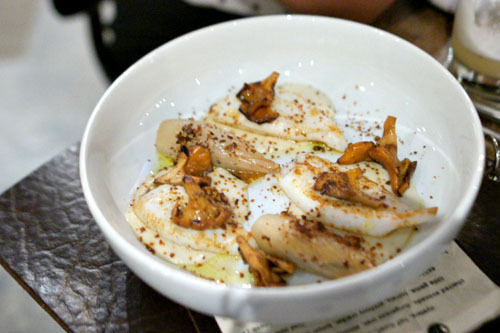 Squid was deftly prepared, coming out supple and springy to the bite, with a delicate flavor that was augmented by the intensity of the mushrooms and miso here, all while the onion gave us a bit of countervailing astringency over a base of subtle sweetness. Our final round of cocktails was a keeper as well. 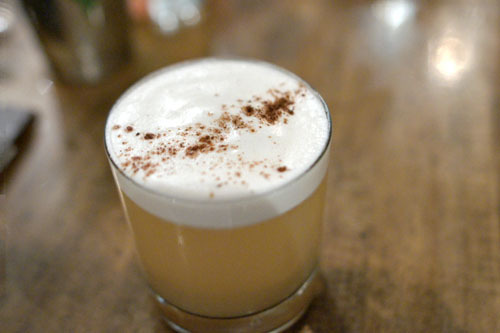 The white whiskey conveyed a strong notion of booziness, set against the sweet and tangy notes present while the liquorice-laced foam served to moderate the drink. On the other hand, the aquavit was much more subtle, with a floral, soft sweetness that melded wonderfully with the spiciness inherent in the spirit. 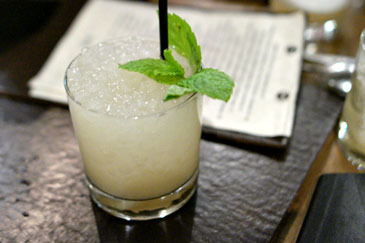 Finally, we had the white rum, which I found a little tropical-tasting in nature, yet light and easy-drinking, with a smart component in the form of that brown butter. 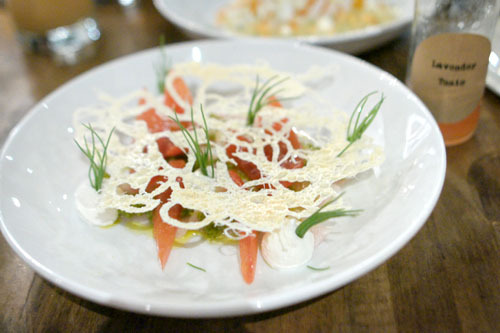 During his stint at The Dining Room, Voltaggio put out the best version of soft shell crab I've had. Here, he shows his facility with the ingredient once more. The SSC was spot on--crispy and just bursting with briny goodness, with the miso mayo adding even more depth and complexity to the crustacean. I loved the levity imparted by the veggies here too, as well as how gnarly that bread looked. 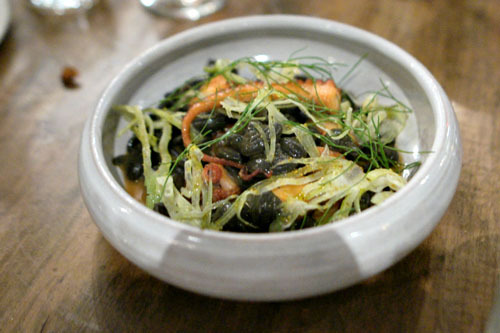 Voltaggio has always had a way with octopus, and this dish was no exception. The octopod came out delightfully supple, with a lovely char and a savoriness to it that worked alongside the pleasantly firm shell pasta and zesty fennel, while the pimenton added a tinge of warmth to the dish. 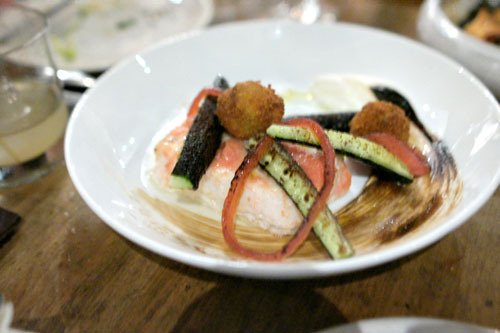 Halibut came expertly cooked--mild, firm, and flaky, with a nice tanginess imparted by the sumac here. My favorite part, though, was that liquid falafel, which served as an excellent exclamation point to the course. 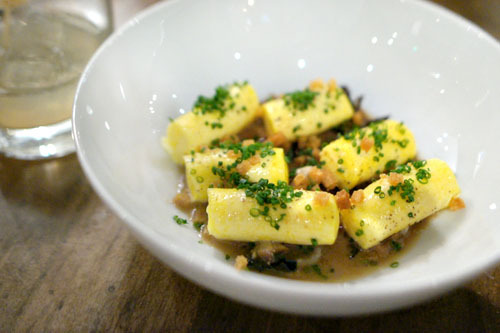 Gnocchi were creamy, rich, liquid-y, and yes, a bit eggy, a luxurious pasta that was rightly heightened by the in-your-face earthiness of the mushrooms. 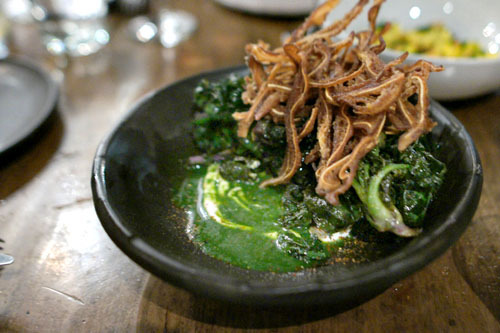 Next was a possible variation on the ubiquitous kale salad that was certainly one of the highlights of the dinner. The bright, verdant bitterness of the veggie was proudly conveyed, yet offset masterfully by the saltiness of those pig ears, all while the crème fraîche-laced broth contributed an enveloping richness that really brought all the elements together utterly cohesively. 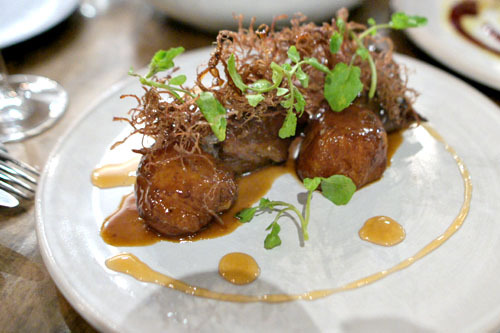 Braised lamb neck was exactly what you'd want: unabashedly, falling-apart tender, with deep, dark, ovine flavors. 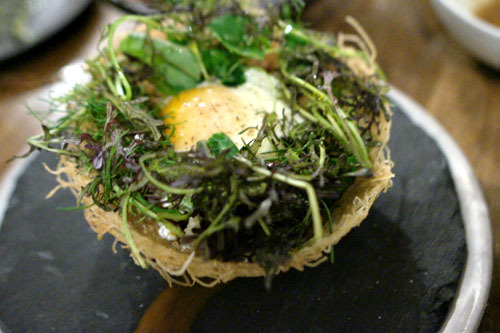 The meat was satisfying alone, but the crunchy "basket" and herbs were what really made it shine. And the runny egg? It pretty much makes everything better. Yum. 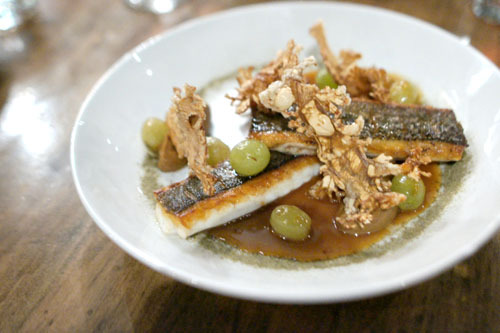 Branzino was pretty divine, delicate in body, with a wonderfully saline relish and delightfully crisp, savory skin. Cauliflower served as a fitting accompaniment, but the combination of caper and grape veered toward overly piquant, stealing some of the attention away from the fish unfortunately. Time for more lamb, this time the vaunted belly. It came out luxurious and fatty (but not overly so), with a whisper of smokiness to it that paired swimmingly with the mushroom. Salsify served to balance out some of the heft of the meat, and there was even a bit of a citrus-y overtone in the dish that I liked. The pork was a winner, coming out soft and succulent, with a delectable porcine relish to it that was further intensified by the veil of lardo draped on top. Beans, meanwhile, served to ground the dish, and I quite appreciated the sweetish tang of that vinegar as well. 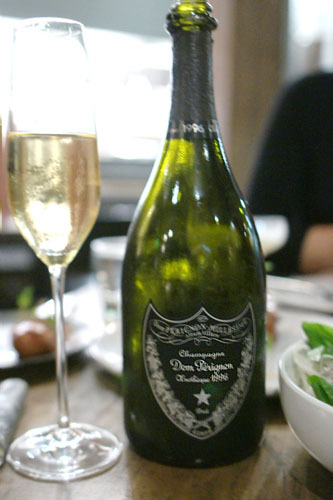 At this point, we popped a bottle of 1996 Dom Pérignon Oenothèque that one of my dining companions had graciously shared. This was, of course, the late-disgorged version of DP, and was very young tasting: tightly wound and fresh, with plenty of tart, lemon-y notes to it, along with a lively acidity and interesting saltiness even. This one should develop nicely. 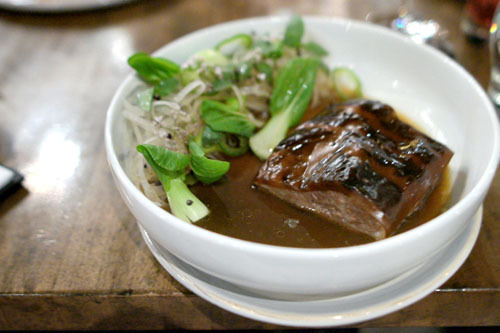 Beef cheeks were downright tender, gelatinous even, and chock full of bovine goodness. They were actually quite heavy taken alone, so the turnips were key in imparting a modicum of levity to the dish. Lovely crunch here from the tangles of beef threads, too. The savories concluded with a superb rendition of pho. The meat itself verged on decadent, with a fantastic beefiness to it and a wonderful crust. 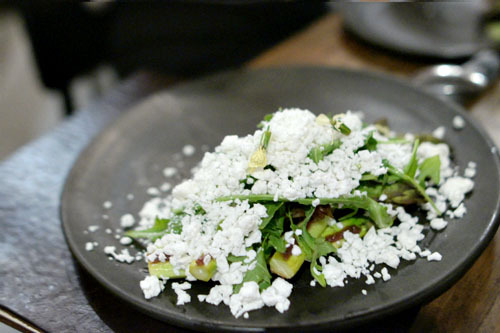 It blended both sweet and savory flavors in a mouthwatering package that paired in commendable fashion with the aromatics of the herbs here, all while the radish contributed a counterbalancing crunch and lightness to the fray. 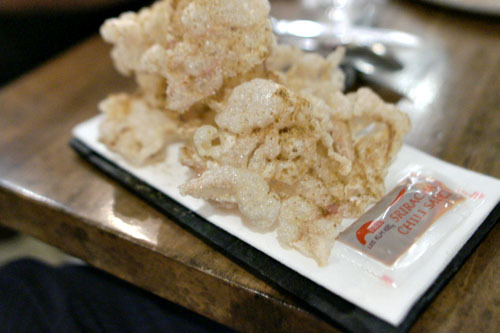 The included tendon chips were great fun as well. 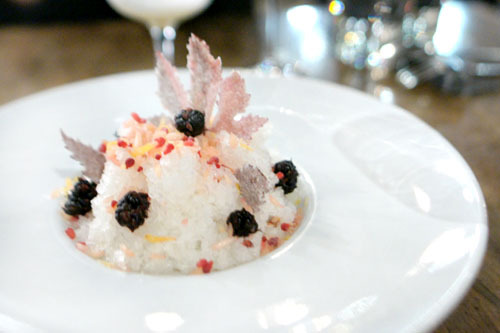 You could almost think of our first dessert as an elevated version of shaved ice. It was completely refreshing and light, with a fantastic blend of fruity, floral flavors accented by the tanginess of that yogurt. Very nice. Yamaimo is well known for its mucilaginous consistency, and here that texture was proudly displayed against a backdrop of multifaceted sweetness, the caramel notes being particularly apparent. Quite cool. I think this is probably the only item on the menu that's been here since day one, and there's a good reason for that. 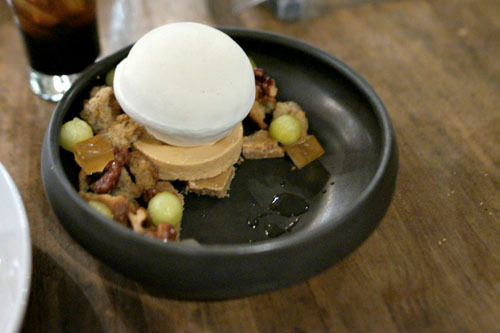 The dessert was as marvelous as ever, with the apple melding beautifully with the caramel while the walnut and semifreddo added opposing smoky and nutty notes to the mix. 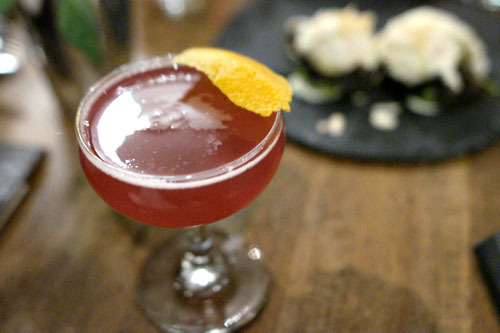 A masterful amalgam of disparate tastes and textures. 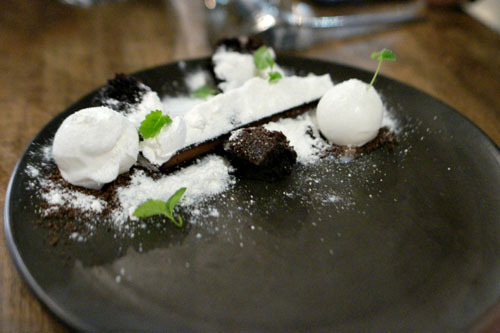 Last up was Ink's take on the requisite chocolate dessert, this one deftly balancing out its richness with contrasting hits of coffee, mint, and bitter notes, with the cream cheese contributing an enveloping lushness to the course. 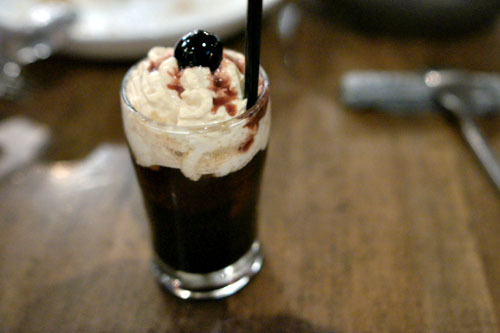 Finally, we had mini versions of the fernet cocktail, an explosion of herbal, woody, minty flavors bound by the soft sweetness of vanilla, cherry, and cola. Quite delicious actually, and a fitting close to the meal. It's been a while, but the restaurant is going as strong as ever. 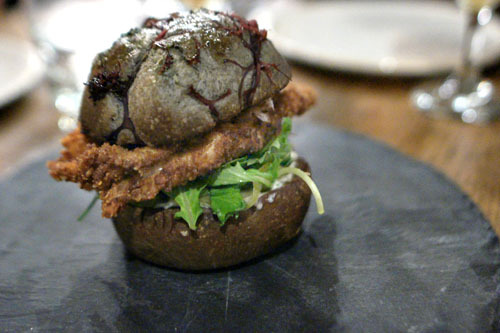 Initially, a lot of people probably dismissed Voltaggio as a serious chef, but I think by this point--almost two years in--he's proven himself. This place is legit, and there's even more maturity in the cooking here now, especially with the very capable Cole Dickinson at the helm as Chef de Cuisine. 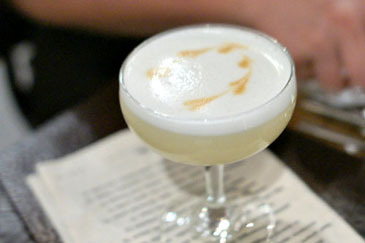 Ink has become sort of a quintessential LA restaurant, and I'm really looking forward to seeing how the place evolves. Kevin, I have to say when I ate at ink about a month ago, I was honestly disappointed in the experience. While our servers were nice enough, I was a bit shocked about the food. 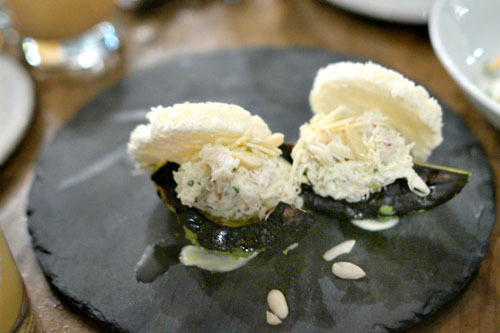 I found the charred avocado dish to be too one note and the seaweed bun of the soft shell crab was so salty, I found it difficult to eat a bite without guzzling some water with it. I thought my visit to LA would have this restaurant pegged as a highlight and I was quite upset at some of the dishes we were served. That seems like an excessive amount of food.